I have to say that I find the sight of David Cameron cavorting with his political enemies in support of the Remain campaign absolutely appalling. I have not felt I had a Member of Parliament since May 2015 and now I don’t think I have a political party to which I want to belong. How Cameron can possibly link himself with Labour’s Harriet Harman (or is it Harperson? ), the leader of the Liberal rump, Tim Farron and the barking mad Green woman, Natalie Bennett, is just beyond my comprehension. 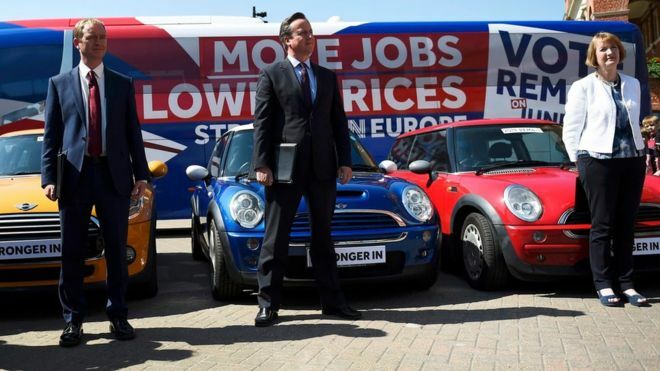 I can only assume Cameron is so desperate to win the referendum that he can swallow any pride he might have had. Win or lose, he has serious questions to answer and I think he is in for a tough time immediately after 2 June 2016 from his own party. It seems to me the result is going to be close so, win or lose, he will face a lot of very angry Conservative MPs and party members. I will wait for the outcome on 23 June but I don’t recognise the party I have supported for 40 years and am very unsure I want to remain a part of it. This entry was posted in Politics and tagged Cameron, Harriet Harman, Natalie Bennett, Tim Farron. Bookmark the permalink. I couldn’t have put it better myself. Cameron has turned the party of Thatcher into the party of Harman. He doesn’t have a true Conservative bone in his body.